How about a frozen beer foam to go with that pint? So spring just arrived, but is it too soon to start thinking about summer already? The season is pretty great: Nice weather, outdoor concerts, a plethora of festivals, allergies are gone, and a lot of delicious fruits are in season. We also get to enjoy snacks like 7-Eleven Slurpees, ice cream, frozen yogurt … and if you happen to be in Japan, you can also add a Kirin beer with frozen foam head to that list. 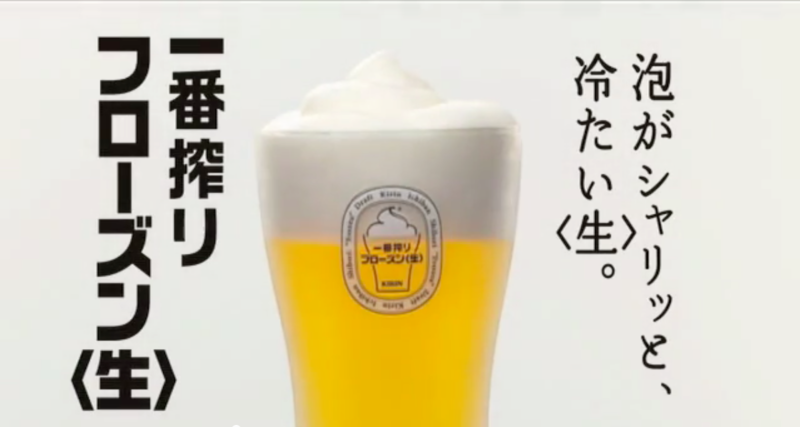 Kirin Brewery is adding to its Ichiban Shibori lineup for restaurants around Japan in May with a new frozen draft that is topped with an ice cold foam on every pint. The tap machine freezes the head of a beer at 23 degrees Fahrenheit (or -5 degrees Celcius) and is added to the top of the beer like soft served ice cream. According to Kirin, this helps to keep your pints cold for up to an extra 30 minutes if you’re a sipper kind of drinker, or you can munch into it like fro-yo. Beer-flavored ice cream? Sign us up! The foam tap machine is able to fluff up the beer by adding air to the drink then flash chilled and stirred to change its consistency. The process, called Frozen Agitation, is the same way frozen custards are made where air is not necessarily an ingredient but is added to the mixture as it gets frozen to form a new solid state. Compare it to whipping up meringue from egg whites. Kirin is preparing to test the product around Tokyo first before sending it all over the country. “We want young consumers to enjoy drinking beer in a new way,” said Koichi Matsuzawa, president of Kirin Brewery. If the Ichiban Shibori Frozen Draft sees a big success, an overseas export could bring this delicious idea to us beer lovers in the states and major cities around Europe. We think Japan just should skip that trial and bring it to America immediately. Why do we think it’ll work? First of all, it’s alcoholic sorbet. Second, frozen beer mugs are awesome. Thirdly, last year, an Alaskan man survived three days stranded in a snow drift by eating the only thing he had with him at the time: Frozen Coors Light. While the man reportedly poured out the alcoholic content to prevent the beverage from lowering his body temperature, he did primarily eat just the chunky bits to keep himself alive while rescuers locate him. Frozen beer saves lives, people! We need it in America now! And lastly, this promo video below which demos how the Ichiban Shibori frozen foam is dispensed is scored by a Frank Sinatra version of “New York, New York” so if that’s not a sign, we don’t know what is.